We have a whole floor dedicated to your learning. You get to work with the latest technology and tools. Moreover, there are 20 different areas in which to practice, so you can perfect your research, study or teaching. This is all part of making you comfortable and confident using the latest tools and technology in any environment, whether it be the classroom or the boardroom. 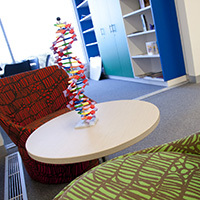 We offer open, light-filled-study areas, private study nooks, and a kitchen and lounge so you can kick back and relax. If you're planning an outdoor adventure, you can use our equipment to download maps, film the event, and edit your footage when you return. 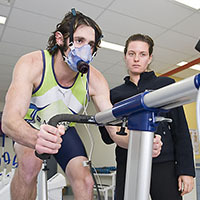 Our new $12.8 Million Monash Peninsula Activity and Recreation Centre (MPARC) sports lab lets you hone your skills with the latest sport and fitness equipment used by professionals, and quantify your performance. You can also apply these tests to your own workouts – on the treadmill, cycle or swim bench – to help develop your own abilities. These tests help measure an athlete's peak performance. They also give you the practical experience that you need to make the best decisions on the field, including how to reduce the risk of injury and boost performance. 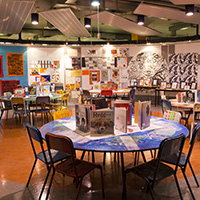 Peninsula students have access to a maths and science lab, and an art room. Our dedicated labs, set-up like school classrooms, give you a first-hand look at what it's like to be a teacher in the classroom. Our teaching facilities include a Mathematics lab, an Art programs, Music workshops, and a Science classroom and lab.